SceneLib is an open-source C++ library for SLAM designed and implemented by Andrew Davison with additional work by Paul Smith. SceneLib 1.0 is released with full source code under the GNU Lesser Public License (LGPL). SceneLib is a generic SLAM library in principle, with a modular approach to specification of the details of robot and sensor types. However it also has specialised components to permit real-time vision-based SLAM with a single camera (MonoSLAM) and the design is optimised towards this type of application. Available alongside the SceneLib library is source code which compiles to the executable program MonoSLAMGlow. 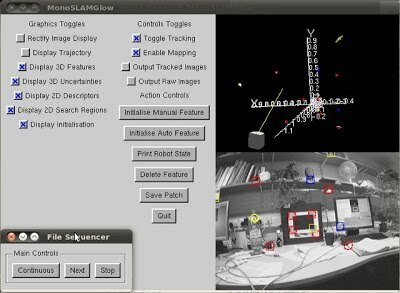 This is an example application of MonoSLAM which can take images in real-time from an IEEE1394 camera or off-line from a disk sequence and perform sparse monocular SLAM. Some of the more advanced techniques we have published such as patch warping are not implemented in this release. As SceneLib is a good starting point to study about Visual SLAM that I am really interested in, I have decided to delve into the code level details. But, when I tried to compile it following the instructions described in its website and readme files, I have got some errors and issues, and it seems like that many things have been changed regarding to the Linux distribution, script and compiler since SceneLib was released long time ago. So, I needed to spend time and effort mostly googling for solving them, and, as I managed to compile and run it now, I am writing this to share my experience with you all. As I need a modern Linux distribution with standard programming tools installed, I chose Ubuntu 10.04 and installed the basic development tools using the below command. Before you install OpenGL and GLUT, please make sure you have the gcc compiler installed first. You can install the Pthread library using the below command. Although there is a comment that the new version 2. * of libdc1394 will not work with VW and other software so need to get the older version 1. *, I just installed the latest version of it as I couldn't find the older one, and disabled the IEEE1394 functionality to use the offline mode only. To do this, please follow the instruction described in http://xforms-toolkit.org/installation.html. Or.. download the XForms source package called xforms.latest_stable.tar.gz, install libjpeg62-dev using the Synaptic Package Manager, and follow the below instructions. You can download SceneLib and all necessary components from the SceneLib’s download page. Unpack the downloaded files to create the following directories which by default should be at the same level (they will look for each other): glow_104, MonoSLAMGlow, TestSeqMonoSLAM, SceneLib and VW34. If you have followed the instructions so far correctly, you shouldn't have a problem to compile the GLOW Toolkit using the below commands. Comment out 'X', 'XFORMS' and 'Firewire' components. Comment out the Qt component. To prevent various error messages, please add '#include <cstdlib>' on the top of the listed files below. To prevent various error messages, please add '#include <cstring>' on the top of the listed files below. To prevent various error messages, please add '#include <cstdio>' on the top of the listed files below. To prevent various error messages, please add '#include <typeinfo>' on the top of the listed files below. Add Ln148 and Ln149 as below. Add Ln 134 and Ln 135 as below. Add Ln 155 and Ln 156 as below. Add Ln 93, Ln 94, Ln 95 and Ln 96 as below. Change Ln 127 as below. Add Ln 72 and Ln 73 as below. If you have followed the instructions so far correctly, you can compile VW34 without any error. If you have followed the instructions so far correctly, you can compile SceneLib without any error. Remove -lVWFirewire from the line defining VWLIBS as below. Remove -D$(OS) and -D$(ARCH) from the line defining CFLAGS as below. Remove $(FIREWIRELIBS) from the line defining LINKFLAGS as below. If you have followed the instructions so far correctly, you can compile MonoSLAMGlow without any problem. If you have followed the instructions so far correctly, you can run MonoSLAMGlow in the offline mode, and you should see its user interface as below.